Have you ever noticed that in the Apostles’ Creed, there are only five persons explicitly named? The Father, the Son Jesus Christ, the Holy Spirit, the Virgin Mary, and Pontius Pilate. At times, I’ve found myself wondering why it is so important to make mention of Pilate in the confession of our Christian faith. Certainly it makes sense that the Persons of the Trinity are highlighted as the Creed announces that at the heart of our belief as Christians is that the deity we worship, who is at work in the world is (three-) Personal. Hence the primary question is not so much “What is God?” but rather “Who is God and how do the Persons of the Godhead relate to creation and the course of history?” And it is certainly appropriate, even for non-Roman Catholic Christians, to draw attention to the blessed Virgin as she is the mother of our Lord, the one in whom Jesus was conceived by the Holy Spirit. But why do we find it necessary to point out that it was under the governorship of Pontius Pilate that Jesus suffered, was crucified, died, and was buried? 1. In the statement, we affirm our belief that Jesus was (and is) a real human person and not a fictional character. Ancient historians other than the authors of what would later be canonized as Scripture also wrote about the leadership of Pilate as the Roman governor over Judea in the first century. Most notably, Josephus, the ancient Jewish historian, wrote about Pilate’s cruel treatment of the Jews in and around Jerusalem. As the Creed is traced back to the end of the 2nd century (over 100 years prior to the adoption of the 27 books of the New Testament as canonical), including the reference to Pilate may have served to combat any notions or rival accounts of Jesus that had him as a mere character in a moral story (imaginary or otherwise) or thought that the Evangelists behind Matthew, Mark, Luke and John embellished some of the stories of the man’s life into legends of miracles, prophetic teaching, etc. of a figure who really wasn’t quite so radical as these “gospels” claimed him to be. 3. In the statement, we affirm that Jesus really did suffer, really did die, and as the rest of the Creed affirms, really did rise again bodily from the dead. Though this reason is less about Pilate himself, and more about the suffering, Pilate’s role in Jesus’ suffering cannot be denied. As the Creed was being drafted, various accounts and doctrines about Christ were being proliferated, including one idea that claimed that Christ was not actually human, but only “appeared” to be so. (See this article about “Docetism” for more info.) Among other reasons that some made this claim was their belief that the physical world, including the body, is evil and hence God could not really take on human flesh. Much less could they come to terms with a God who would enter suffering to such a degree as to taste death. Against this sort of understanding lay the tradition handed down from the apostles to the days when the Creed was drafted and adopted and through the course of history to our present day that affirms that Christ was really and fully human and really suffered to the point of death on a Roman cross in Jerusalem, under the gubernatorial direction of Pontius Pilate. 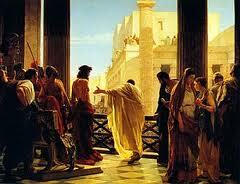 Pilate, of course, can only see things from a this-worldly perspective. As far as he knows, the only place you get truth is out of the sheath of a sword (or, as we would say, out of the barrel of a gun). Political ‘truth’; my truth against your truth, my sword against your sword, with those two meaning much the same thing. And ultimately, for a Roman governor, my truth against your truth, my power against your weakness, my cross to hang your naked body on. Ah, but that’s the truth. The truth that belongs with Passover. The truth that says that one man dies and the others go free. Barabbas, the brigand…faces the gallows as well…[but] the Truth stands there in person, taking the death that otherwise would have fallen on the brigand. Pilate didn’t see it at the time…This is what the cross will mean. This is what the truth is and does. Truth is what Jesus is; and Jesus is dying for Barabbas, and for Israel, and for the world. And for you and me. The question in our court is that which was also implicitly asked in Pilate’s: how will we respond when faced with the Truth of a kingdom breaking into this world from another, but which bids us not to take up our swords, but to take up our crosses and be willing to suffer with our Lord in this world? Excellent observation Jeff! You have great insight about the meaning of Scripture!